Today Geoff and I drove all the way out to the end of the Bay to look for backcountry trails. We haven't been out that way since winter hit, mostly because it's a 45-minute drive (hard to justify when there's so much to do so much closer), and also because the entire area is populated by Orthodox Russians. I see them shopping at Safeway on a regular basis, in their homemade dresses and lacy caps reminiscent of southern Utah polygamist wives. However, driving out to their side of town is a little unnerving. I figure if they're still so culturally segregated after 150 years of U.S. occupation, there's a good possibility that they don't take to kindly to a couple of Outsiders bombing down their roads in a 1989 Honda Civic with two bikes strapped to the roof. But I could be wrong. 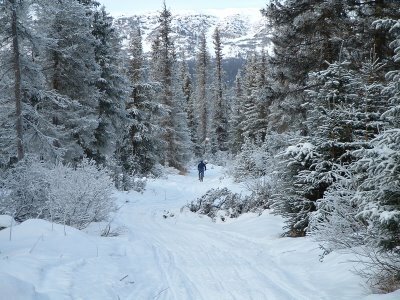 Anyway, we did discover the holy grail of Homer's winter trails, a far-reaching network that wraps around Caribou Lake. The area is breathtaking - for its proximity to Homer (also known as the banana belt of the North), the windswept bog around Caribou Lake has all of the frozen desolation and sweeping remoteness of the state's Interior. Geoff stood under the twisting branches of a black spruce and said, "Wow. It almost feels like we're in Alaska." So what to do? Well ... Stay on the bike. Go back to Caribou Lake and put in a full day. Crawl out from whatever ice rut threw me sideways, take a deep breath of the cold wind pounding across the frozen bog, and keep on pedaling. I think I have it in me. I had doubts about my first century, but even after not training and not sleeping and not even having a clue about the wonders of drafting, I still did OK. Sure, the Susitna 100 is completely different. But, in many ways, it's not. Just gotta have faith. I'm not any kind of expert, but I have done a few very long bike races, and the training advice I follwed never suggested tapering off training and carbo-loading as early as a month in advance - if you do, you might start losing fitness, and the extra carbs will probably turn to fat (which I guess you might need for insulation anyway). When I did an 8 day mountain bike stage race last year, with each day running to between 70 and 90 miles, the programme I was given by a good local coach had me doing my toughest training a month to three weeks before the event. If he was right, your training should probably be peaking right now. Based on my (admittedly limited) experience, you should probably put a few good long days (six hours maybe), and one really epic ride (8 to 10 hours) over the next couple of weeks to prepare mentally and physically for a big effort. Two weeks before your race you could start reducing the volume of your training while maininting intensity, and one week before take the volume right down to a few short sharp sessions (an hour or so) just to stay fresh. At least that's what the books, and my local coaching guru suggest. 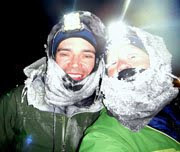 But that said, I can't begin to imagine what training in Alaskan conditions is like, and I am almost certainly talking straight through the top of my hat. Just running through some of the Alaska blog sites. Your blog is one of the nicest I've seen so far. I am new at all this blogging. I help run an awesome fishing camp on the Nushagak river. The predictions in 2006 for the Nushagak river are the best in a decade. The largest run of king salmon in Alaska! We have had people hooking onto sixty or more fish in a day. The king salmon fishing there is the best in the world, no question. Anyone with questions please feel free to email me or visit my web sites or blog. You'll be fine ... I expect. Hey, but runners would have to be wearing snowshoes in some of the areas you're going, right? You may not be aware, but Ashton has a snowshoe race every year at their "American Dog Derby," you know, the one I wrote my blog about. I think it's just a 5k, but I've heard it's a killer. I think I agree with Nic, though. Tapering seems like it ought to be done the last week or two before the race, not the last month. I could be wrong about that, but you're still saving up for a single-day effort (like Lotoja, I'll admit) and that means you need your body to give a lot of power without stopping for the entire day. That's the link for La Ruta de los Conquistadores' recommended training program. If you read about it, it's a lot more like your race, except that it takes place over three days instead of one. It recommends tapering only for that last week. I just found your blog, seems like you have quite the task ahead of you, good luck! You have more dedication than I do that is to be sure. After 10 miles in the snow I start to rue the day I ever started bicycle commuting, which isn't even close to what you are planning. I look forward to reading all about your progress. Keep at it, your doing great. I can't even imagine doing what your doing. Uh, those Russian Orthodox are Old Believers. Yes, they're ethnic Russians, but some of them have been in Alaska barely a year, having emigrated here from, say, Brazil. The first local Old Believer village, Nikolaevsk, was settled in the 1970s. The East End Road villages (Voznesenka, Razdolna, and Kachemak Selo) split off from the first village. The Old Believers were oppressed in Czarist Russia, sent to Siberia, and sought religious freedom in China, South America, and eventually Oregon and Alaska. If you want to find descendants of the Russians from Russian Alaska, the closest place to find them is Ninilchik. Calling Old Believers "Russian Orthodox" is kinda like calling Roman Catholics "Baptist."